There are moves to find compromise between the HoR and HSC in order to confirm Mohamed Shukri in his post as new CBL Governor. Sources in the House of Representatives (HoR) have told Libya Herald that Mohamed Shukri could take up his post as new Governor of a unified Central Bank of Libya after all. The revelation comes on the back of the official rejection by UNSMIL of the process by which Mohamed Shukri was appointment new Governor of a unified CBL. 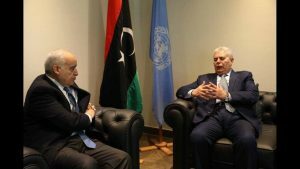 HoR sources, however, have informed this publication that in private discussions with Shukri, UNSMIL head Salame was open to the idea – if the HoR and the High State Council (HSC) could come to an agreement. The HoR source reported that a ‘‘large bloc’’ of HSC members were in favour of the Shukri appointment. Moreover, a HoR source insisted that Salame was proactively ‘‘working on a consensus between the HSC and the HoR to enable the new Governor to take office’’. The reported statements were alleged to have taken place during ‘‘an hour and a half long meeting’’ between Salame and Shukri Tuesday during which Shukri had ‘‘explained his urgent plan to improve the financial situation of the expenses, provide liquidity and return the dollar exchange rate to its normal status’’, the HoR source added. The HoR source added that ‘‘Shukri said that blocs of the HoR and the HSC were working together to find viable solutions and consensus between the two houses in order not to disrupt the election of the Governor in the public interest’’. Shukri had ‘‘confirmed their communication with him and their reassurance to him that things will go well’’, the source added. The source had also indicated that Salame himself was keen for Shukri to take up his post and was working to get him confirmed in his new post. However, in a written response to this publication, UNSMIL said that it ‘‘did not reject the appointment of the new governor of the CBL. For UNSMIL, the issue is not the “who” but the “how”, i.e. the selection process and not the person of Mohamed Shukry, Saddik El Kaber or anyone else for that matter’’. ‘‘The Mission took note of the HoR’s selection of Mohamed Shukry as CBL Governor. It also affirmed that the selection process should be implemented according to the LPA – Article 15, which presupposes consultation between the HoR & HCS before selecting the incumbents of sovereign leadership positions’’. ‘‘Thus, the selection process should have been done in consultation with the HCS. The unification of Libya’s institutions is the supreme goal that the UN and Libyans should work towards. This is UNSMIL’s message to all parties on this matter’’. ‘‘As for the content of the discussion between the SRSG and Mr. Shukry, the SRSG reiterated the UN position above’’, UNSMIL concluded. Meanwhile, HoR member for Rujban, Salah Suhbi expressed his frustration at international opposition to the new HoR CBL Governor appointment. “We have elected a new governor of the CBL. He has to begin immediately with the aim of easing the high inflation rates and solve the devaluation problem of the Libyan Dinar’’. ‘‘Gone are the bad, corrupt days of Saddik Kaber who was backed by one or two ambassadors that did not respect the long-term relations between Libya and their countries”, he concluded. It will be recalled that Ali Hibri and the other three eastern-alligned CBL Board members have announced their readiness to hold a board meeting – called for by Faiez Serraj – in order to unify the CBL. They have accused El-Kaber of putting up preconditions for such a meeting and in effect refusing to unify the CBL. It will be recalled that Saddek El-Kaber was first dismissed from his post back in April 2015. The decision (No. (14) of 2015) to sack him was signed by Ali Hibri, who at the time represented the only internationally recognized government and parliament, the HoR. Secondly, the Skhirat Libyan Political Agreement stipulates that all HoR decisions taken since 2014 would be reviewed by a joint committee. This would include the decision to dismiss Kaber. No joint committees have met or reviewed the CBL Governorship yet. Keber also does not recognize any CBL decisions taken in meetings held outside Libya, such as those held in Tunisia. Libyan law / CBL regulations stipulate that all such decisions must be taken in meetings held within Libya. On the other hand, leading Libyan lawyer and human rights activist Azza Maghur has criticised UNSMIL for double standards when it comes to the interpretation and implementation of the LPA.